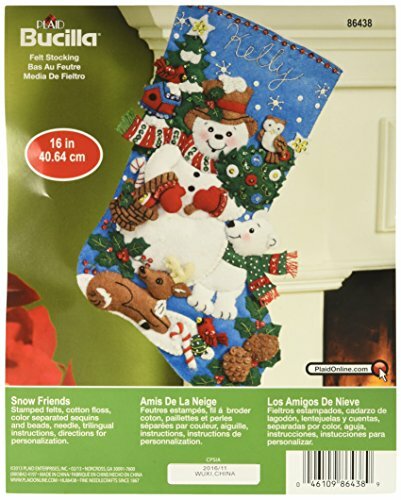 Bucilla 86438 Felt Applique Stocking Kit (16-Inch), Snow Friends, 16"
Festive designs, quality materials and generous embellishments continue to make Bucilla felt stockings a favorite stitchery tradition. Stocking kits include: stamped felt, embroidery floss, beads, needles and tri-lingual instructions. Many stocking designs have coordinating ornament sets and tree skirts to create a complete decorating ensemble. This Bucilla felt applique stocking kit is 16". View More In Felt Applique Kits. If you have any questions about this product by Bucilla, contact us by completing and submitting the form below. If you are looking for a specif part number, please include it with your message. BUCILLA 86665 Felt Applique Stocking Kit Peace on Earth, Size 18"